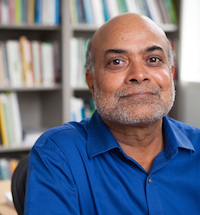 Prabhu Pingali is a professor in the Charles H. Dyson School of Applied Economics and Management at Cornell University, with a joint appointment in the Division of Nutritional Sciences, and the Founding Director of the Tata-Cornell Institute for Agriculture and Nutrition (TCI). Prior to joining Cornell, he was the Deputy Director of the Agricultural Development Division of the Bill & Melinda Gates Foundation, from 2008 to May 2013. Pingali was elected to the US National Academy of Sciences in 2007. He is also a Fellow of the American Association of Agricultural Economists. He has over three decades of experience working with some of the leading international agricultural development organizations as a research economist, development practitioner, and senior manager. He has written ten books and over 100 refereed journal articles and book chapters on food policy. Pingali, P. and Sunder, N. (2017). Transitioning Towards Nutrition-Sensitive Food Systems in Developing Countries. Annual Review Resource Economics, Volume 9. Published online in April. https://doi.org/10.1146/annurev-resource-100516-053552. Pingali, P., Mittra, B., and Rahman, A. (2017). The Bumpy Road from Food to Nutrition Security – Slow Evolution of India’s Food Policy. Global Food Security, published online May. https://doi.org/10.1016/j.gfs.2017.05.002. Pingali, P. (2016). Opinion: The Hunger Metrics Mirage: There’s Been Less Progress on Hunger Reduction Than it Appears. Proceedings of the National Academy of Sciences, 113 (18) 4880-4883. Pingali, P. (2015). Agricultural Policy and Nutrition Outcomes - Getting Beyond the Preoccupation with Staple Grains. Food Security: The Science, Sociology and Economics of Food Production and Access to Food, 7: 583-591. Pingali, P. (2015). Wringing Food from the World. Book Review of Ruth Defries' "The Big Ratchet." Nature Geoscience, 8: 1. Pingali, P (2015). Book Review: Rosamond L. Naylor (Editor): The Evolving Sphere of Food Security. Food Security, 7(6): October. Pingali, P. and Ricketts, K. (2014). Mainstreaming Nutrition Metrics in Household Surveys – Toward a Multidisciplinary Convergence of Data Systems. Annals of the New York Academy of Sciences, 1331: 249-257. Dubé, L., Webb, P., Arora, N.K., and Pingali, P. (2014.) Agriculture, Health, and Wealth Convergence: Bridging Traditional Food Systems and Modern Agribusiness Solutions. Annals of the New York Academy of Sciences 1331: 1-14. Herforth, A., Frongillo, E., Sassi, F., Seneclauze Mclean, M., Arabi, M., Tirado-von der Pahlen, C., Remans, R., Mantilla, G., Thomson, M., and Pingali, P. (2014). Toward an Integrated Approach to Nutritional Quality, Environmental Sustainability, and Economic Viability: Research and Measurement Gaps. Annals of the New York Academy of Sciences, 1332: 1-21. Wu, G., Fanzo, J., Miller, D.D., Pingali, P., Post, M., Steiner, J.L., and Thalacker-Mercer, A.E. (2014). Production and Supply of High-Quality Food Protein for Human Consumption: Sustainability, Challenges, and Innovations. Annals of the New York Academy of Sciences, 1321: 1-19. Pingali, P. (2010). Agriculture Renaissance: Making “Agriculture for Development” Work in the 21st Century. Handbook of Agricultural Economics, 4, 3867-3894. The Netherlands: Elsevier. Reardon, T., Stamoulis, K., and Pingali, P. (2007). Rural Nonfarm Employment in Developing Countries in an Era of Globalization. Agricultural Economics, 37, 0, 173-183. Raney, T., Pingali, P. (2007). Sowing a Gene Revolution. Scientific American, 10. Pingali, P. and Feder, G. (2017). Introduction to Agriculture and Rural Development in a Globalizing World. In P. Pingali and G. Feder (Eds.) Agriculture and Rural Development in a Globalizing World: Challenges and Opportunities. Earthscan Food and Agriculture Series. London, New York: Routledge. Pingali, P. and Rao, T. (2017). Understanding the Multidimensional Nature of the Malnutrition Problem in India. In P. Pingali and G. Feder (Eds.) Agriculture and Rural Development in a Globalizing World: Challenges and Opportunities. Earthscan Food and Agriculture Series. London, New York: Routledge. Pingali, P., Witwer, M., and Abraham, M. (2016). Getting to Zero Hunger: Learning from the MDGs for the SDGs. In International Society and Sustainable Development Goals, Chapter 5. Portada: Thomason Reuters. ARANZADI. Pingali, P., Spielman, D., Zaidi, F. (2016). Changing Donor Trends in Assistance to Agricultural Research and Development in Africa South of the Sahara. In J. Lynam, N. Beintema, J. Roseboom, and O. Badiane (Eds.) Agricultural Research in Africa: Investing in Future Harvests (Chapter 6). Washington, DC: ASTI/IFPRI. Pingali, P., Ricketts, K., Sahn, D. E. (2015). Agricultural Pathways to Improved Nutrition: Getting Policies Right. In D. Sahn (Ed. ), The Fight Against Hunger and Malnutrition: The Role of Food, Agriculture, and Targeted Policies (pp. Chapter 7). Oxford, UK: Oxford University Press. Pingali, P. (2006). Westernization of Asian Diets and the Transformation of Food Systems: Implications for Research and Policy. Food Policy, 32, 3, 281-298. The Netherlands: Elsevier. Pingali, P. (2007). Agricultural Mechanization: Adoption Patterns and Economic Impact. Handbook of Agricultural Economics, 3, 2779-2805. The Netherlands: Elsevier. Pingali, P., Khwaja, Y., and Meijer, M. (2007). The Role of the Public and Private Sectors in Commercializing Small Farms and Reducing Transaction Costs. In J. Swinnen (Ed.) Global Supply Chains, Standards and the Poor: How the Globalization of Food Systems and Standards Affects Rural Development and Poverty, 267. United Kingdom: CAB International. Lipper, L., Pingali, P. and Zurek, M. (2007). Less-Favoured Areas: Looking Beyond Agriculture towards Ecosystem Services. In R. Ruben, J. Pender, and A. Kuyvenhoven (Eds.) Sustainable Poverty Reduction in Less-Favoured Areas. CABI Publishing, Wallingford, 442-460. Wallingford, England: CAB International. Professor of Applied Economics and Director of the Tata-Cornell Institute for Agriculture and Nutrition(TCI), Cornell University, Ithaca, NY, United States. (2013 - Present). Professor of Nutritional Sciences, Cornell University, Ithaca, NY, United States. (2013 - Present). 1982 - Ph.D. in Economics (Minor in Statistics), North Carolina State University, Raleigh, North Carolina. 1977 - M. A. (Hons.) in Economics (5-year program), Birla Institute of Technology and Science, Rajasthan, India.